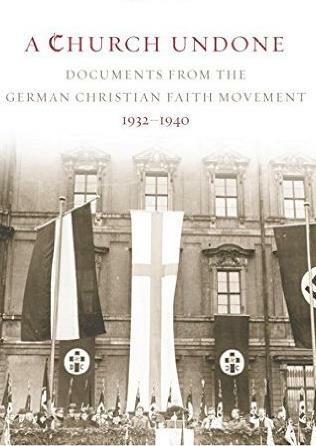 A Church Undone: Documents from the German Christian Faith Movement 1932-1940. Selected, Translated and Introduced by Mary M. Solberg. Minneapolis: Fortress Press, 2015. 486 pp. Mary Solberg’s A Church Undone is a welcome addition to the literature on support for Hitler within the German Evangelical Church during the 1930s and 40s, as it is the first sourcebook in English of primary documents that reveal how pro-Nazi Protestant Christians thought about Hitler and the National Socialist movement. To this point, English-speaking students of the German Church Struggle have been reliant on two sorts of resources: anthologized declarations and lists of “guidelines” produced by German Christian (Deutsche Christen) groups, or secondary sources that describe and interpret the German Christian movement more generally. Some of these secondary sources—e.g. Robert Ericksen’s Theologians under Hitler (1985), Doris Bergen’s Twisted Cross (1996) and Susannah Heschel’s The Aryan Jesus (2010)—have been invaluable resources for those who teach this period in the church’s history. What English-speaking readers have been missing are translations of longer narrative apologies for National Socialism that reveal the depth of religious passion many Protestant leaders felt for the Nazi revolution. In some cases, the texts selected and translated by Solberg nicely complement the secondary sources mentioned above. For instance, she includes excerpts from Gerhard Kittel’s Die Judenfrage (The Jewish Question, 1933) and Paul Althaus’s Politisches Christentum (Political Christianity, 1935), both of which are discussed in some detail in Ericksen’s Theologians under Hitler, but which before now have not been available in English. Similarly, Solberg includes a long excerpt from Wer ist Jesus von Nazareth (Who Is Jesus of Nazareth? 1940) by Walter Grundmann, whose contributions to pro-Nazi theological scholarship are explored by Heschel. Solberg includes other texts that may be familiar to students of the German Church Struggle, including official responses by the theological faculties at the Universities of Marburg and Erlangen to efforts to introduce the Nazi Aryan Paragraph in the Protestant churches, Reinhard Krause’s infamous 1933 speech at the Berlin Sports Palace, and the Godesberg Declaration (1939). To illumine the church-historical context in which these texts came to be, Solberg groups them with documents from the “other side,” notably “Theses on the Aryan Paragraph and the Church” by Dietrich Bonhoeffer and “Theological Existence Today” by Karl Barth (1934), which is difficult to find in English, as well as excerpts from a response to Barth by Emmanuel Hirsch titled Das kirchliche Wollen das Deutschen Christen (What the German Christians Want for the Church, 1933). If Hirsch was able to support the Nazi revolution while maintaining the appearance of academic respectability, the most intriguing selections in this book are by Nazi enthusiasts who had little desire to appear respectable or temper their enthusiasm for Hitler. These include Arnold Dannemann’sDie Geschichte der Glaubensbewegung der “Deutsche Christen” (The History of the German Faith Movement, 1933), The German Christian National Church Union’s Handbuch der Deutschen Christen (The Handbook of the German Christians, 1933), which features a section on “The German Prophet” (a double entendre referring to both Luther and Hitler) by Anna Ilgerstein-Ratterfeld, Joachim Hossenfelder’sUnser Kampf (Our Struggle, 1933), Friedrich Wieneke’s Deutsche Theologie im Umriss (Outline of German Theology, 1933), Constantin Grossman’sDeutsche Christen: Ein Volksbuch (German Christians: A People’s Book, 1934), Julius Leutheuser’s Die deutsche Christusgemeinde: Der Weg zur deutsche Nationalkirche (The German Community of Christ: The Path to the German National Church, 1935), Siegfried Leffler’s Christus im dritten Reich der Deutschen (Christ in Germany’s Third Reich, 1935), Ludwig Müller’s Deutsches Gottesworte (God’s Word in German, 1936), Otto Brökelschen’s Was wollen die Deutschen Christen? (What Do the German Christians Want? 1937), and The Organization for German Christianity’s Jesus und die Juden! (Jesus and the Jews! 1937). A Church Undonealso contains a bibliography of primary and secondary sources, an index, and a helpful 40-plus page introduction. In it Solberg relates how she came to embark on this project (one of her students happened upon a German Christian pamphlet in a local library), reflects on continuing widespread ignorance of German Christianity’s complicity in the success of Nazism, provides a historical overview of the Church Struggle and the shifting institutional expressions of the German Christian movement, comments on the intended audiences of the documents she has translated, discusses her criteria for selection, and reflects on what reading this material today can teach us. On this latter point, Solberg identifies “the momentum of antisemitism,” “the power of public discourse,” and what it means to be a “real” Christian. In addition, each document or collection of documents is separately introduced and facsimile copies of original book and pamphlet covers are included. Among the many themes that emerge in these documents, I will mention three. One striking leitmotif is the authors’ persistent habit of describing Hitler in quasi messianic terms as a reincarnation of Luther and a divine gift to the German Volk. A few examples of this sort of rhetoric will suffice to convey the admiration and awe Hitler evoked in the lives of many Protestant Christians who had lived through the dark night of Germany’s soul: “…with Adolf Hitler and National Socialism an epoch in German history has begun that is at least as decisive for the German people as…the epoch of Martin Luther” (125); “The Führer…was utterly aware of his divine mission” (126); “Even today [Müller] describes this first meeting with the Führer Adolf Hitler as a turning point in his life” (144); “God fashioned for himself a man…and gave him the greatest mission in our history: to pull the German people up out of despair and to restore their faith in life” (147); “…Adolf Hitler, with his faith in Germany, as the instrument of our God became the framer of German destiny and the liberator of our people from their spiritual misery and division” (197); “when Germany can no longer survive, then Luther must arise” (243); Hitler is “the best man imaginable, a man shaped in a mold mad of purity, piety, energy, and strength of character” (246); “[Hitler], the most German man, is also the most faithful, a believing Christian. We know that he begins and ends the course of his day with prayer, that he has found in the Gospel the deepest source of his strength” (302); “because of Adolf Hitler’s faith, the Germans’ road of suffering and earth could be transformed into resurrection” (329); “in the person of the Führer we see the one God has sent, who sets Germany before the Lord of history….” (346); “…in the pitch-black night of Christian church history, Hitler became like a wonderful transparency for our time, a window through which light fell upon the history of Christianity” (347); “[we are experiencing] the hour of grace that the eternal Lord has granted us through Adolf Hitler….” (353); “…without the appearance of Adolf Hitler four hundred years later, Martin Luther’s act would not have fulfilled its total significance for Germany” (357); “…the Third Reich has grasped the German mission that God has set before us” (373); “We believe that God reveals himself today in the history of the German Volk through Adolf Hitler. The Führer, who calls Germans to faith and unites them in love, is the instrument of God’s revelation, the German prophet (408); “With all the strength of our faith and our active life we serve the man who has led our people out of servitude and misery to freedom and true greatness” (445). What is remarkable about such passages, apart from their eerie consistency, is how far they depart from the view of Hitler we have today, a view that is refracted through our knowledge of the carnage of World War II, the tremendum of the Holocaust, his persecution of the Nazis’ opponents (like Bonhoeffer), or the seemingly endless stream of TV documentaries that play on our fascination with Hitlerian evil. A second theme to note in these documents is the reflexive habit of Christian authors during the Church Struggle to view German Jews as descendants of an ancient “witness-people” providentially destined to suffer in history. As the theological faculty at the University of Erlangen put it in responding to a query about the soundness of introducing the Aryan Paragraph in the Protestant Church, Jews’ alien status in Germany is ultimately rooted their God-willed “landless dispersion among the peoples” (68). Or as Gerhard Kittel put it in 1933, “real Judaism remains true to its symbolic being as a restless and homeless sojourner wandering the earth” (219). This Augustinian conception of Israel’s dispersion and suffering as theologically necessary, which is also reflected in Bonhoeffer’s “The Church and the Jewish Question,” obviously did not help Christians in Germany perceive Jews as fellow citizens in need of protection and support. A third theme to note in these documents is the tendency of pro-Nazi Christians to portray their opponents in the Confessing Church as acting or thinking “Jewishly.” As Siegfried Leffler wrote in 1935, “today the German Christian must defend his faith in the Savior against two antagonists. One is Jewish Christianity, the other, modern paganism” (350). The Confessing Church, argued Otto Brökelschen in 1937, is “caught up in a Jewish Christianity or a Christian Judaism” (413). Opponents of the German Christians turned the charge back upon them, as when critics of the Godesberg Declaration charged its authors with “making a Phraisaic sect out of the Christian church” (451). That this tactic was utilized widely among the confessors is confirmed by Solberg’s inclusion of Bonhoeffer’s “Theses on ‘The Aryan Paragraph in the Church,” where he writes that “a church today that excludes Jewish Christians has itself become a Jewish Christian church, and has fallen away from the gospel, back to the law” (72). Solberg’s initial reaction to some of these texts—“I marveled at their simple-minded theological slogans and overheated nationalism, their crass antisemitism and Hitler-worship” (9)—remains a temptation for all of us who are trained to detect theological nonsense and have been graced with the gift of historical hindsight. But in selecting, translating and introducing these documents, Solberg invests them with the importance they deserve as warning signs from a church undone by racism, rabid nationalism and political naïvete.